Silvia Gustavo led <?xml:namespace prefix = st1 ns = "urn:schemas-microsoft-com:office:smarttags" />Brazil with 18 points, Fernanda Neves 13, Alessandra Santos 12 and Adrianinha Pinto 9 points with 8 rebounds. The Brazilians had a rough start, making just one field goal (3 point) in the first quarter to finish down 13-7. Argentina had Erica Sanchez with 6 points and Brazil had Karen Gustavo and Fernanda Neves with 3 points each. Brazil shot 1-13 from the field and made four free throws in the first ten minutes. Argentina didn't score for 8:09 minutes between the first and second quarter, their last basket was with one minute left in the first as Paula Reggiardo netted a three pointer. Brazil made a 17-0 run to be up 22-13 and finish the first half up 25-21. Karen Gustavo led with 7 points, Adrianinha Pinto and Jucimara Dantas 5 points each. Erica Sanchez had 12 points for Argentina. In the third quarter Brazil defined the game as Adrianinha and Alessandra combined themselves on both sides to force turnovers and make Argentina take bad shots during the rest of the game. At the end of the third quarter Brazil had a 50-35 lead. Helen Luz along with Alessandra, who won the 1994 FIBA World Championship, sealed the victory for Brazil in the final minutes, especially Helen who made a three pointer with 46 seconds left to send their fans into a frenzy. 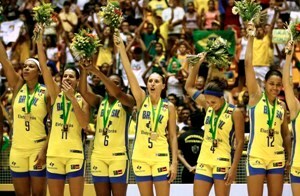 At the end Adrianinha Pinto of Brazil was selected as the MVP of the tournament. The Brazilian point guard averaged 10.8 points, 4.8 rebounds and 4.6 assists in five games played. In the loss Erica Sanchez had 13 points and Paula Reggiardo 11.